Spray 5-quart slow cooker with cooking spray. Rub pork with 1 tablespoon salt. In 12-inch skillet over medium heat, melt butter; cook pork in butter 2 to 4 minutes on each side or until browned. Transfer pork to slow cooker. In large bowl, beat root beer, molasses, tomato paste, mustard, chili powder and garlic with whisk. Stir in onion. Pour mixture over pork in slow cooker. Cover; cook on Low heat setting 7 to 9 hours or until pork is tender. Meanwhile, in large bowl, mix mayonnaise, sugar, lemon juice, mustard, 1/2 teaspoon salt and the pepper. Add slaw mix, and toss to coat. Cover and refrigerate at least 1 hour, but no longer than 10 hours. Stir before serving. Carefully transfer pork to cutting board; let stand about 5 minutes or until cool enough to handle. Shred pork, discarding any pieces of fat and cartilage. Return pork to liquid in cooker, and toss to coat and heat through. Using slotted spoon, top buns with pork mixture. 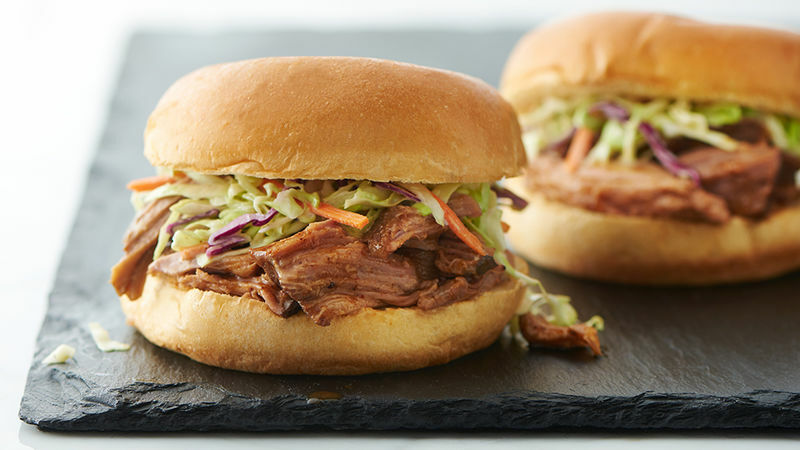 Top pork with slaw. Don’t have time to make dressing? Use 3/4 cup prepared cole slaw dressing instead. Storing leftovers? Make sure to pour the cooking liquid over the shredded pork to keep pork from drying out.